The events we remember in stark relief, the events that change us or change our world, may be the closest we'll ever get to time travel. No matter how far away time takes us from them, we can always, always return. Most Americans who were cognizant on September 11, 2001, remember the day in elaborate detail. Where we were when we first saw the footage or heard the news, what we thought or feared at the time, how we felt and how we made sense of it in those first few days after. One interesting aspect of events that go down in history is that, if you ask people years or decades later about what they remember, you come away with not just a record of the event itself, but of the world as it existed on the day it occurred. If you ask people now about 9/11, hidden quietly behind the atrocities is this oddly-preserved snapshot of our lives on a particular day some eleven years ago. Where we were living, what we were doing, our struggles and our hopes and fears and personal tragedies, what mattered to us and what was floating around in the zeitgeist, all frozen in the amber of memory because of the evil that interrupted it. 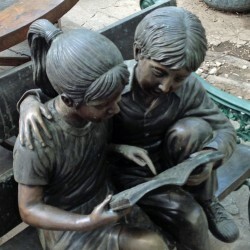 But it isn't just these monumental events that send repercussive ripples through multiple lives, and every day could be a snapshot of our interconnected world if only we were to remember it. 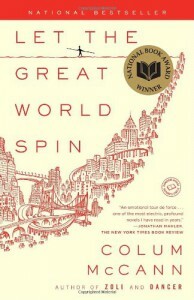 One can't really say that Colum McCann's Let the Great World Spin is about 9/11, because it takes place in 1974 and never mentions the event. It might be more accurate to say that the book is imbued with 9/11, a visceral artistic response to the attacks that would somehow be made tacky and crude if it were to discuss them directly. I don't think I could read a novel that was about 9/11, that would try to wring some glib literary pablum from the slaughter and the wreckage and that cloudless bright morning. It is still too soon for that, for me, and may always be. But in August 1974, another event caused New Yorkers to stop in their tracks and look up at the World Trade Center in disbelief. That morning, a man strung a tightrope between the tops of the towers, and for an hour danced back and forth across the high wire. McCann uses this event (which really happened, accomplished by famed funambulist Philippe Petit) as the fulcrum around which he spins the lives of his multiple characters. The tightrope walk and its aftermath intersects with their various lives in separate ways, and it means something different to each of them. But in the end, this is not a book about an event or its effect. It's about what's already happening in their lives when it occurs. It's a snapshot of a particular day: how it interconnects people in ways they don't even know, how it affects the past and the future, how it incarnates the larger cogs of history's machine. This novel is intensely personal, focusing on individual lives, but as a whole it is as diverse and broad as New York City itself. Because what is a city but an abundance of individual lives? And what is any particular day but another incremental step in each of those lives: toward destruction or salvation, isolation or connection, grief or contentment, death or new creation?